Having brought the Philadelphia Orchestra up to undisputed first place in the concert hall, the ever-energetic Leopold Stokowski now works off some of his surplus steam by organizing a brass band. So far it has given but two concerts, both in private, but soon or late, I daresay, it will be forced into the open. My advice to the nobility and gentry is to book seats for the first public concert the instant they go on sale. For here is richness, indeed! Aided by a friendly bootlegger I heard the second private concert in Philadelphia last Sunday. It was the middle of the week before I was fit for my usual literary and spiritual exercises. Brass bands, of course, are numerous, and many of them are good ones. But this is a brass band of an entirely new sort. Stokowski has neither tried to batter his audience into unconsciousness with mere noise, in the manner of the Italian conductors, nor endeavored to make his band an imitation orchestra, in the fashion of John Philip Sousa. Instead he has sought, within the natural limits of his medium, to augment its flexibility, its variety, its dignity – in brief, to convert it into a first-rate musical instrument. I can only report that the results he achieves are colossal. Here, at last, is a brass band that can play Bach! But where are players for such super-bands to be obtained? Apparently Stokowski found no difficulty in getting them together. He began with the brass and woodwind performers of the Philadelphia Orchestra, and added a few string players who could also toot. Volunteers began to wander in from the lesser Philadelphia orchestras. Soon there was a band of a hundred men and forty performers – and all of them played divinely! The concert began with a Sousa march (followed by two more as encores) and proceeded to "The Blue Danube" waltz, Schubert's familiar "Moment Musical" (for woodwind) and Sibelius' "Finlandia". That was the first part. The second part consisted of three Wagner numbers: the entrance of the gods into Walhalla from "Das Rheingold", Wotan's Farewell, and the Feuerzauber from "Die Walküre" and the funeral march from "Götterdämmerung." Another intermission, and then the climax: the Bach Passacaglia, hitherto arranged by Stokowski for orchestra, and now heard, perhaps for the first time, for brass band. All these things were scored for the band by the conductor himself. Even the Sousa marches showed some new touches. Sousa himself used to play them with the aid of double-basses and a huge battery of percussion instruments. Stokowski omitted the double-basses and reduced the percussion to its usual orchestra strength, with only one bass drum and one set of kettle drums. The effect was superb. All the familiar rattle was gone; instead there was a clear, bell-like lovely sonority – a magnificent swirl of pure sound. If Sousa was not in the house he missed something. His marches were played perfectly for the first time. "The Blue Danube", it seemed to me, was relatively a failure. The Strauss waltzes all need the voluptuous whine of the strings; trumpets are too blatant and forthright for them, and the woodwind, unsupported, is too cold. Whatever the cause, the immortal "Donau" descended, more than once, to mere prettiness. Its divine beeriness was gone. Strangely enough, "Finlandia" lost almost as much. The first part, to be sure, was magnificent – and the band took it in rapid tempo with astounding ease and precision. But the second part, reduced to the bald woodwind, lacked pathos. Here, too, the sentimentality of the catgut was missing. In the Schubert piece the woodwind got its revenge. It had the floor alone – and it made such loveliness as these ears have not heard since January 16, 1920. But all this was merely preliminary: the concert really began with the Einzung from "Das Rheingold." Here Stokowski achieved a double triumph: first with his scoring and then with his conducting. The familiar music leaped into life at the first note: one presently began lamenting that Wagner had written it for orchestra, not for the brass band. There was endless variety and endless charm in the tone-color. Exquisite combinations followed one another enchantingly. And always there was almost perfect playing. What a first trumpet! What a pair of flutes! And what a row of trombones up there against the back-wall! The "Walküre" piece was somewhat less effective, probably because it was overlong. It was a very warm afternoon, and even Wagner loses his potency when bald heads begin to glitter. But in the Feuerzauber Stokowski offered some effects of the ver first caliber – not imitation orchestra effects, but undisguised band effects, yet how delicate always, how charmingly appropriate to the music! The pianissimo of the band toward the end became almost fairy-like. It seemed incredible that that great gang of men could play with so soft and exquisite touch. The audience sat as silent as the dead. The Trauermarsch went off almost as well, but the "Rheingold" scene, I think, remained the bright, shining star of the Wagner section. Ah, that there had been a slice of "Tristan und Isolde", of "Die Meistersinger", or of "Parsifal"! Maybe they will come later. For one, I'd like to hear the band tackle the Liebestod. Would it be sacrilege to hand that incomparable elegy over to gentlemen in bright yellow uniforms, blowing tubas on a warm Sunday afternoon? Answer one: you have not heard the Philadelphia Band. Answer two: you have heard the thing done by fat sopranos, horribly encased in tallow and tale. Bach ended the day – and Bach at his most lordly. Perhaps the heat was beginning to tell: perhaps the transplantation of Bach to the modern orchestra, done in this case by Stokowski himself, had had an evil effect. Whatever the cause, it seemed to me that the Passacaglia was somewhat muddy in the first part – that the threads of polyphony ran together. The clear line of the fiddles was missing, and the even clearer line of the 'cellos. The clarinetists were poor substitutes. This obviously was against reason. Bach wrote mainly for the organ: his actual orchestra was a band of oboes and flutes far more than it was a band of strings. A brass band – that is, a Stokowski brass band – should get nearer to him than even a grand orchestra. I can only report that the Passacaglia languished until the very end. Then it rose magnificently and passed off with truly thrilling doings by the trumpets and trombones. 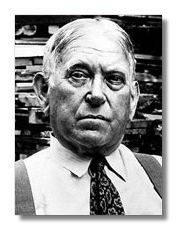 Stumpf commentary: This essay was among several in a book, H. L. Mencken on Music. It was published in paperback in 1975. I was familiar with Mencken as a writer but not with his writings on music until I came across this book. Mencken obviously thought a lot of Stokowski; he opens by calling the Philadelphia the finest in the world thanks for the Maestro. I found it somewhat amusing that Stokowski formed a band "of a hundred men"… and the girl? The trumpeter was probably Solomon Cohen, first trumpet of the orchestra since 1918. [Thanks to Ed Johnson for looking up the information in Twenty-Five Years of the Philadelphia Orchestra written by Frances Ann Wister and published in 1925.